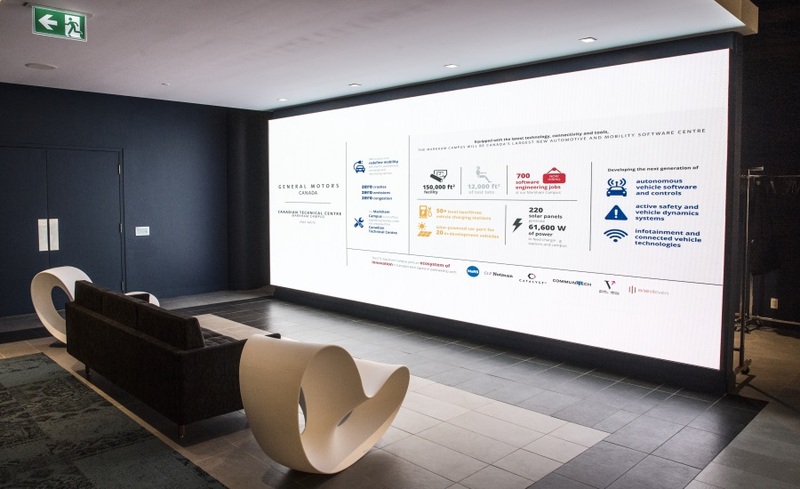 Like HP and Canon, visitors entering the lobby of General Motors’ new facility are treated to an LED screen showing off the size of the facility’s research space (12,000 square feet), the amount of power generated by its 220 solar panels (61,600 watts – enough to power at least four four-bedroom homes for a year), and its goals (to develop the next generation of autonomous vehicle software and controls, active safety and vehicle dynamics systems, and infotainment and connected vehicle technologies). 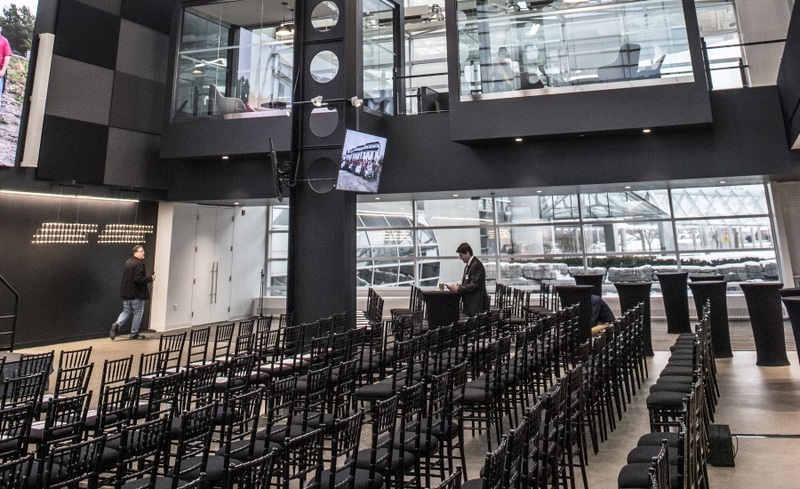 In fact, above the stage is a glimpse of what that collaborative space looks like, with two sound-dampening pods that comfortably seat between four and six people, and a pair of restaurant-like booths (located behind the pods) for those who don’t mind the white noise of chatter around them. 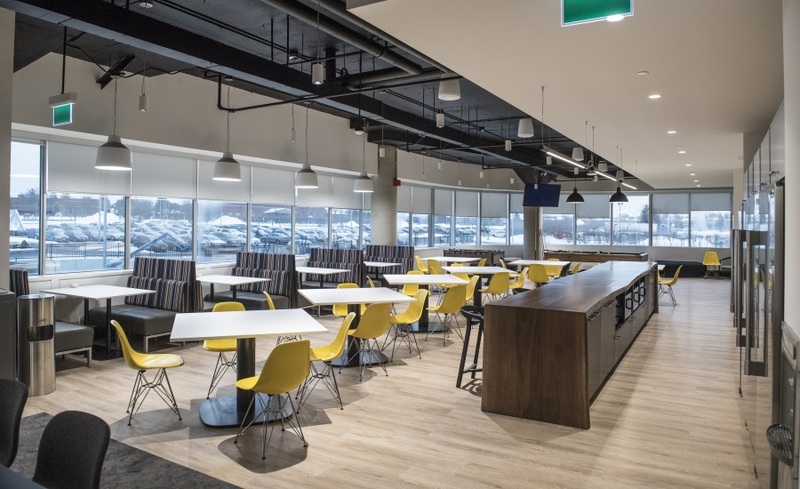 One of our favourite features of the Technical Centre was its approach to ambient decoration: Reflecting Canada’s natural landscape, the first floor is decorated with a water theme, the second (shown here) is based on land, and the third is air, with an image of the northern lights greeting visitors on the third floor. 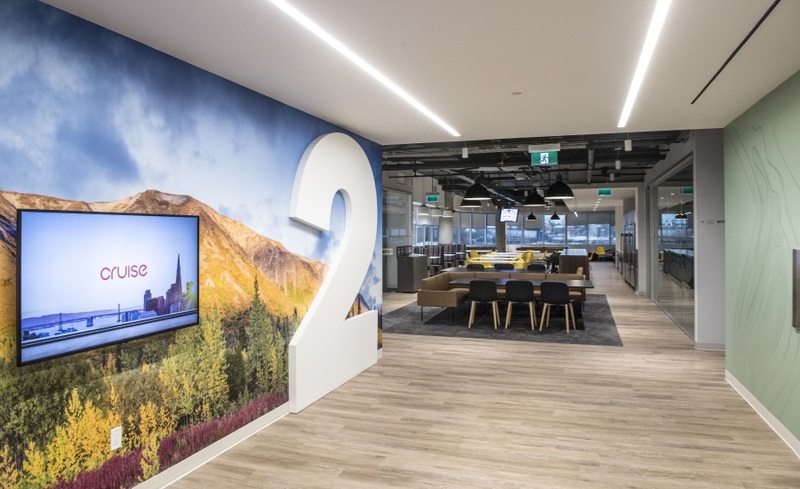 “A lot of our workforce was born in Canada, but a lot of them just arrived in Canada too, and we thought it was an exciting opportunity to show off different parts of Canada coast to coast so that people can learn about their new home,” Tossan says. After exiting the elevator, second-floor visitors are invited to visit another location straight out of the startup playbook – a well-stocked cafeteria. 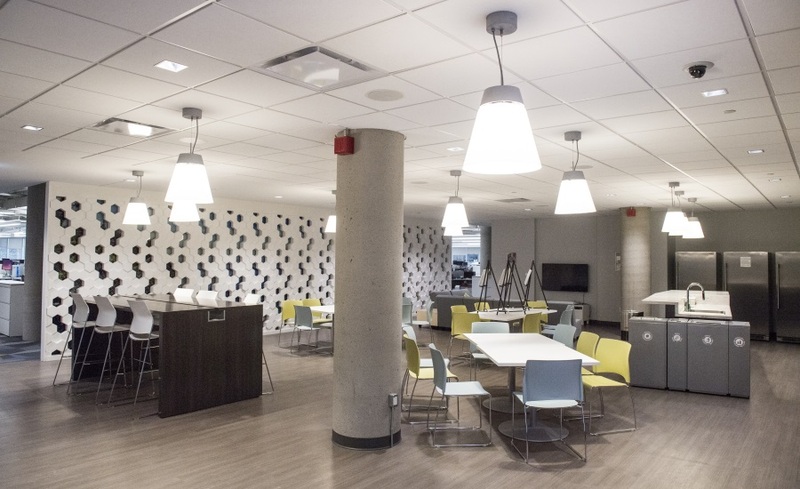 Like many of the centre’s spaces, it’s designed to facilitate collaboration. 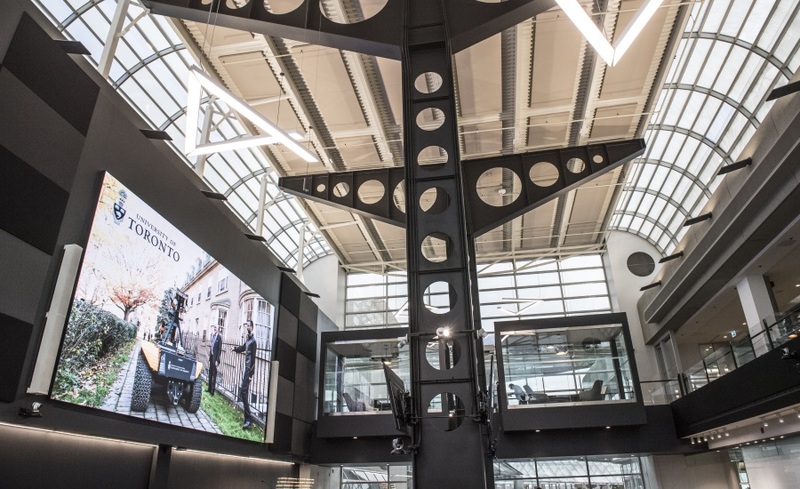 “We placed these café spaces right at the entrances to the elevators to give employees an opportunity to collide, if you will, with anybody they might need to chat with over the course of the day,” Tossan says. That employees have to pass a few tables to reach the coffee machines first thing in the morning is no accident either. 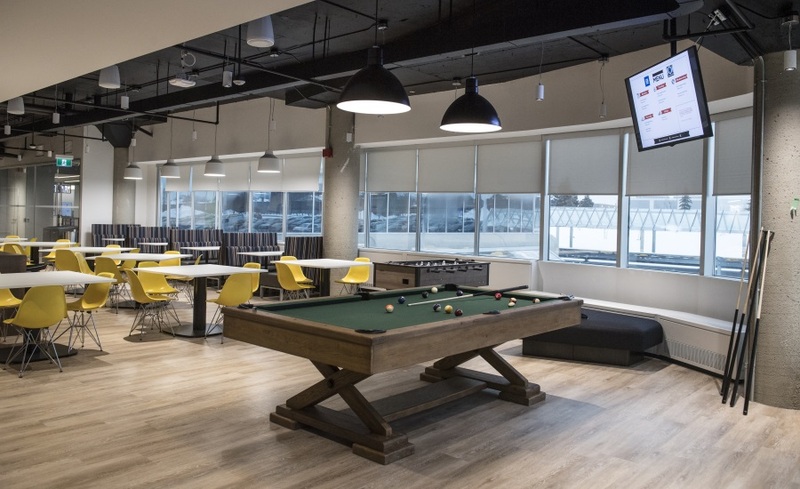 “And then of course we don’t just work hard here, we play hard here, so we have the requisite pool and foosball tables to create those social connections,” Tossan adds. And if you look out the windows on a clear day you see the CN Tower in the distance. 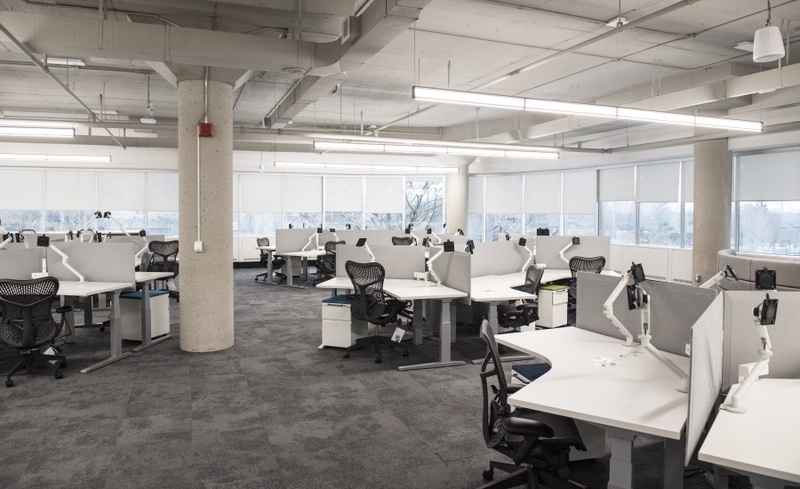 The collaborative atmosphere extends to the office space, which primarily hosts software developers – Tossan notes that in many cases cars have more than 150 “computers” – modules controlling every vehicle feature from a rearview camera to a lane assistance function. 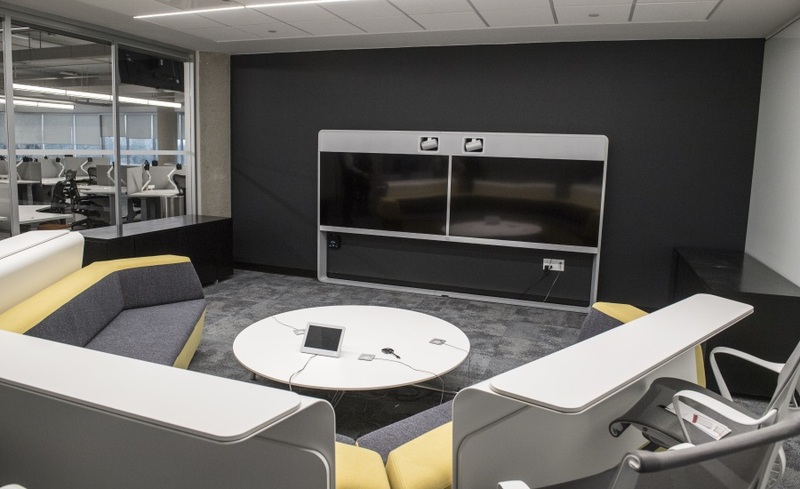 The open layout allows for both individual work and quick collaboration, and the whiteboards – GM’s favourite method of sharing information – can easily be moved around. “You can move directly from a conference room discussion to a workstation discussion,” Tossan says. Other spaces are more openly collaborative, such as the training room. Still others provide a mix. This first-floor café is known as the town common. 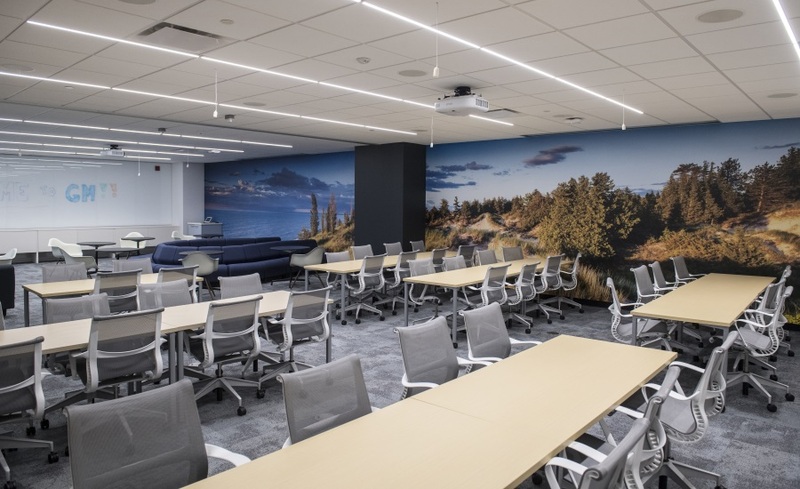 GM didn’t send any photos of the centre’s lab spaces, but this video conferencing boardroom, known as the “campfire” room, illustrates how some of the facility’s collaborative features stretch outside Markham’s borders. 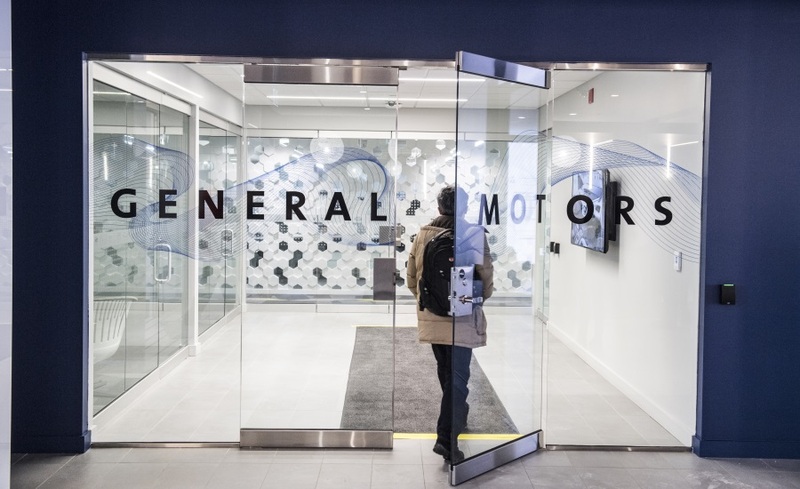 In addition to building test simulations for software developed on-site, Technical Centre employees can remotely collaborate with their counterparts in Michigan or Beijing as easily as their colleagues in nearby St. Catharines or Oshawa, thanks to a data-sharing platform that lets GM’s software engineers work on products from across the world. From the outside you can tell the Technical Centre was originally an American Express call centre – give or take the 50 or so electric vehicle charging stations – but it’s a fine addition to GM’s network, which in Ontario alone includes three manufacturing facilities (in nearby Oshawa; Niagara Falls neighbour St. Catharines; and Ingersoll, outside London), an extreme weather testing facility in Kapuskasing, and soon, a mobility centre in Toronto itself. 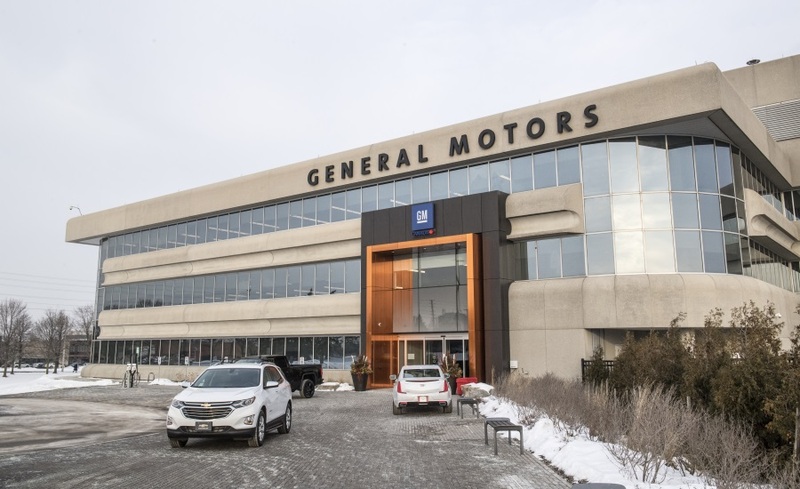 “The idea is for each of GM’s centres to tailor GM products to their respective markets,” Tossan says.